Have you ever hit a wall when taking your sketch to paint? Whether it’s the daunting task of jumping into coloring, or midway through completing the piece that you run out of steam, this video will teach you how to reach the finish line! By simplifying the painting process into four main stages, we can tackle any level of visual challenge. In this video I will walk you through my process of completing a full illustration. We'll go from the beginning stages of the sketch, into the world of color, through the task of editing, and finally dive into the juicy details at the end! Packed full of tips and tricks of how to work through any issue, this video will give you the tools to tackle your own detailed illustration! For additional benefit, follow along with the provided PSD! It was super fun seeing the piece come together and the challenges and evolution of it! Very good tips too! There is always something to be learned when watching an artist go through their process and Anna does a great job at explaining why she makes the decisions she does while working on her piece. Beautiful work and a joy to watch a professional do their thing. Wonderful course! I hope to see more from her :) I like how all her layers are visible while she shows her work. Quick and to the point with great explanation! Can't wait to try it out! Few of the best tips and techniques I have ever come across for digital illustration and painting with lights in general. I love the fact that a narrated speedpaint as well as a detailed process video was both demonstrated. Helps a lot. 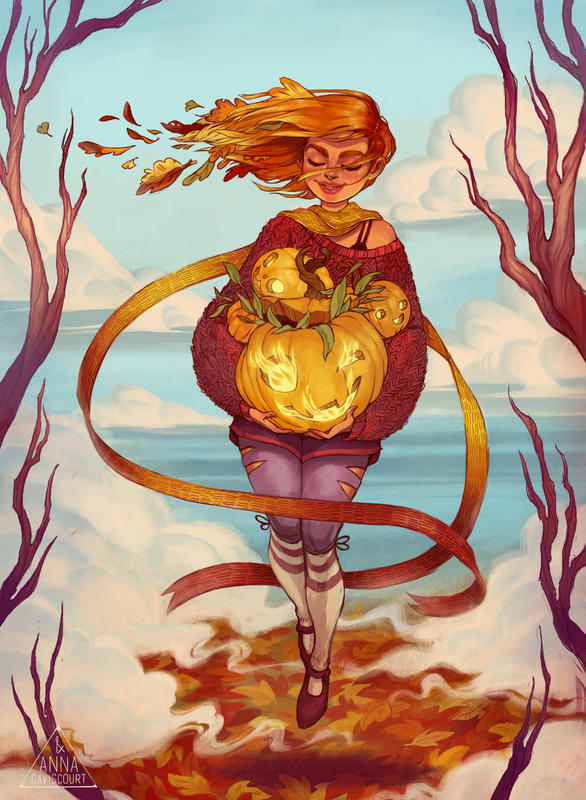 Anna Daviscourt is a concept artist in the game industry, as well as a freelance illustrator. Her whimsical work ranges from loose and colorful sketches to finely detailed paintings. She also teaches independent studies at PNCA in Portland, Oregon, and dreams of one day owning a pet corgi!